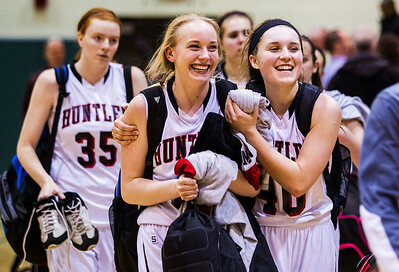 Kyle Grillot - kgrillot@shawmedia.com Huntley freshman Morgan Clausen (center) and senior Samantha Andrews celebrate as the team walks off the court after beating South Elgin the girls class 4a sectional Tuesday in Crystal Lake. 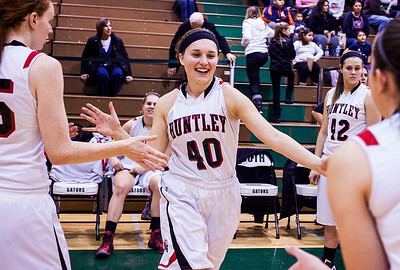 Huntley beat South Elgin, 49-32. Kyle Grillot - kgrillot@shawmedia.com Huntley senior Samantha Andrews is greeted by her teammates before the start of the girls class 4a sectional Tuesday in Crystal Lake. Huntley beat South Elgin, 49-32. Kyle Grillot - kgrillot@shawmedia.com South Elgin senior Kennede Miller (left) puts up a shot under pressure from Huntley senior Bethany Zornow during the first quarter of the girls class 4a sectional Tuesday in Crystal Lake. 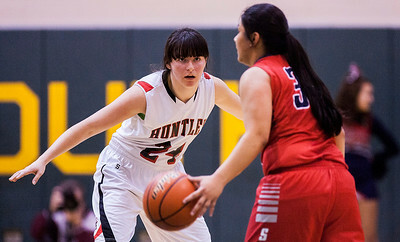 Huntley beat South Elgin, 49-32. 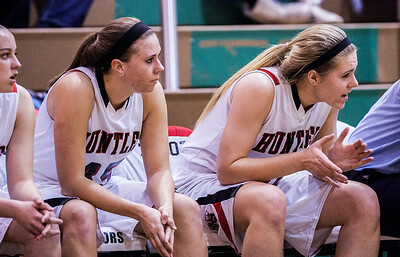 Kyle Grillot - kgrillot@shawmedia.com Huntley sophomore Ali Andrews cheers on her teammates from the bench during the second quarter of the girls class 4a sectional Tuesday in Crystal Lake. 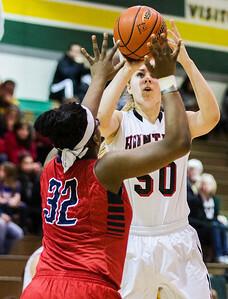 Huntley beat South Elgin, 49-32. 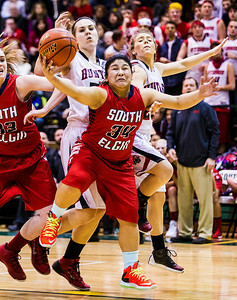 Kyle Grillot - kgrillot@shawmedia.com Huntley senior Bethany Zornow guards South Elgin senior sophomore Nadia Yang during the second quarter of the girls class 4a sectional Tuesday in Crystal Lake. Huntley beat South Elgin, 49-32. 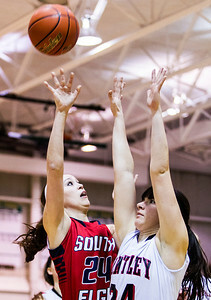 Kyle Grillot - kgrillot@shawmedia.com South Elgin senior sophomore Nadia Yang puts up a shot under pressure from Huntley senior Bethany Zornow during the first quarter of the girls class 4a sectional Tuesday in Crystal Lake. 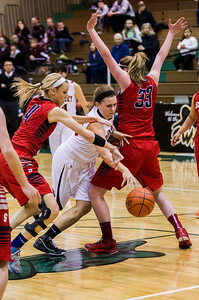 Huntley beat South Elgin, 49-32. 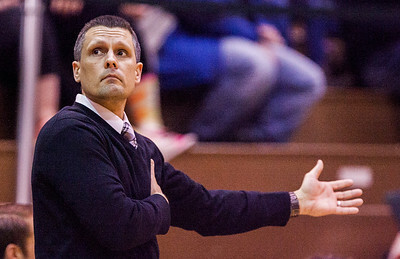 Kyle Grillot - kgrillot@shawmedia.com Huntley head coach Paul Perrone motions to his players during the second quarter of the girls class 4a sectional Tuesday in Crystal Lake. Huntley beat South Elgin, 49-32. 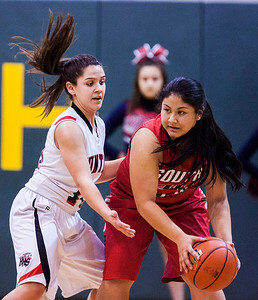 Kyle Grillot - kgrillot@shawmedia.com South Elgin senior sophomore Nadia Yang (right) is guarded by Huntley sophomore Kayla Barreto during the first quarter of the girls class 4a sectional Tuesday in Crystal Lake. Huntley beat South Elgin, 49-32. 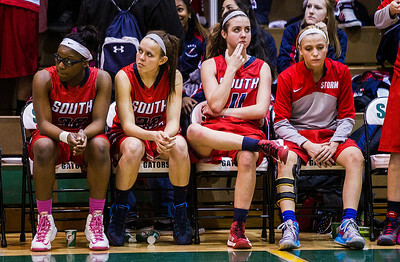 Kyle Grillot - kgrillot@shawmedia.com The South Elgin bench watches as the game comes to a close during the fourth quarter of the girls class 4a sectional Tuesday in Crystal Lake. Huntley beat South Elgin, 49-32. Kyle Grillot - kgrillot@shawmedia.com Huntley sophomore Kayla Barreto dribbles towards the net during the second quarter of the girls class 4a sectional Tuesday in Crystal Lake. Huntley beat South Elgin, 49-32. 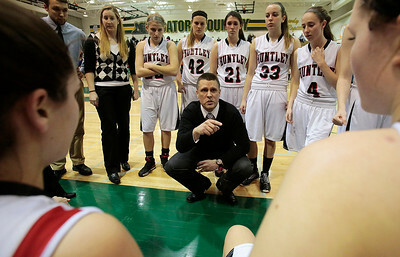 Kyle Grillot - kgrillot@shawmedia.com Huntley head coach Paul Perrone talks with his players during a time out in the third quarter of the girls class 4a sectional Tuesday in Crystal Lake. Huntley beat South Elgin, 49-32. 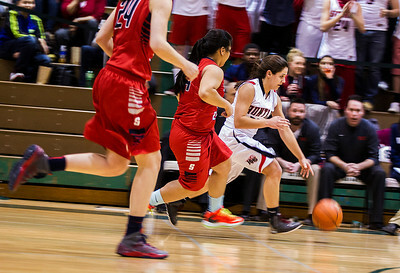 Kyle Grillot - kgrillot@shawmedia.com Huntley senior Rachel Zobott (center) dribbles past South Elgin junior Kelli Rubino (33) during the third quarter of the girls class 4a sectional Tuesday in Crystal Lake. Huntley beat South Elgin, 49-32. Huntley sophomore Kayla Barreto dribbles towards the net during the second quarter of the girls class 4a sectional Tuesday in Crystal Lake. Huntley beat South Elgin, 49-32.